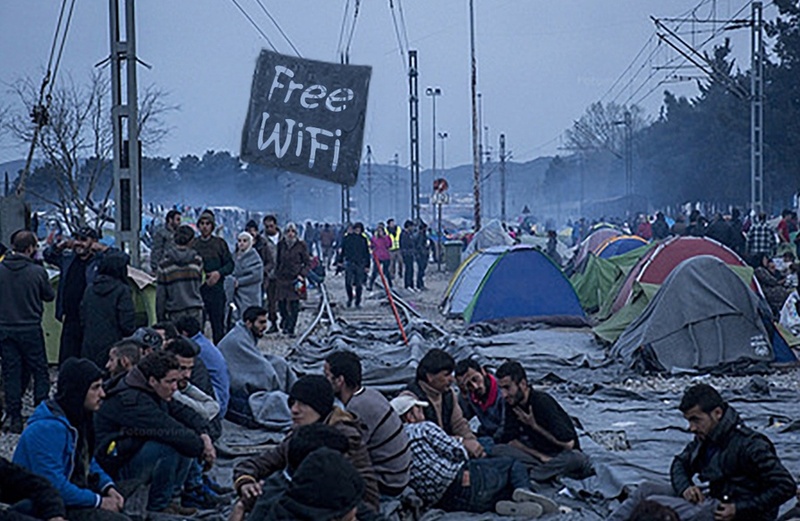 In September 2015, Ilias Papadopoulos brought a free Wi-Fi connection to a refugee camp in Idomeni, Greece using Ubiquiti APs. Ilias Papadopoulos, an electrical engineer from Greece, first arrived at the refugee camp in August 2015 to research how he could help the refugees in this camp. Though the Idomeni refugee camp can only accommodate 4,000 people, the number of the population grew to 13,000. The first thing Papadopoulos noticed upon his arrival was that the majority of the refugees owned cell phones without SIM cards. Due to the fact that Greek authorities didn’t provide enough assistance in facilitating refugees’ communication with relatives, Ilias Papadopoulos started gathering materials to build a Wi-Fi station at the camp. To build a proper infrastructure Ilias had to spend 5,000 euros of his own money and in one month he managed to create a self-sustaining, remotely accessible Wi-Fi hub. This hub is charged by solar panels during the day and recharged by two powerful running batteries through the night. A connectivity is brought to the access points in the hub by two ADSL lines, that are affiliated with the same line as of the telephone and can only provide a bandwidth of 10 Megabits per second bandwidth. Papadopoulos used both the mono-band and the dual-band (Pro) version of the UniFi Ubiquiti access points, in order to support every device (Some of the refugees’ smartphones can only access single-band connections whereas others can access dual-band.) An old laptop serves as the control panel for the whole operation. Currently, there are 8 access points in the camp that can host a total of 960 users at any given time throughout the camp, each access point hosts up to 120 simultaneous users. The Internet access is relatively slow during the day while at nights the connection is much faster as there are fewer people connected at once. Throughout the crisis, Internet connectivity has played a vital role in providing important information for the refugees and enabling communication with their families abroad. The government of Greece has decided to relocate emigrants in different areas of Europe, as part of the European Union’s official relocation program and as the border with Macedonia is closed, the future of the Idomeni refugee camp is uncertain. Even if the Idomeni refugee camp closes, Papadopoulos’ Wi-Fi station can be placed in another camp. For now, the Idomeni refugee camp is the only place with Internet access, but Ilias Papadopoulos is searching for sponsors to fund the expansion of free Wi-Fi to several other refugee camps in Greece.